Studies on the 16S rDNA gene have already given some interesting results either by differentiating V. vulnificus against other representatives of the Vibrio or by differentiating type B from type A strains, thus allowing an understanding of mixed infections and seasonal variation between strains. Indirect study with PCR-DGGE showed sensitivity based on a pure culture of Escherichia coli of between 104 and 105 cfu/mL. A study of the 16S-23S rDNA spacers highlighted the possibility of detecting NCBV strains in oysters, demonstrating the value of such molecular methods to identify pathogens that will not grow on artificial media whatever species they are. DNA probing the cth and tlh genes (hemolysin-related genes) allowed authors to differentiate V. vulnificus and V. parahaemolyticus, respectively. However, polymorphism is still a major problem to find strain-specific or species-specific probes not cross-reacting with other vibrios. 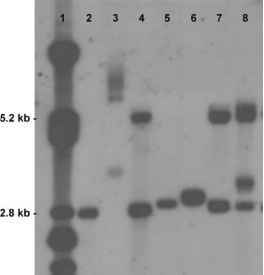 Several regions such as cytolysin, vvhA (V. vulnificus hemolysin gene), pR72H (a 0.76-kb Hindlll DNA fragment cloned from V. parahaemolyticus), and 16S-23S rRNA were simultaneously used to specifically identify this bacterium. The vvhA gene responsible for the production of the cytolytic hemolysin of V. vulnificus and its activation by the cAMP receptor protein (CRP) has also been extensively studied. Mutagenesis study of a virulent V. vulnificus strain identified four essential capsular polysaccharides (CPS) for virulence expression. A seminested PCR on the vvhA gene showed its transcription in NCBV populations and may be very useful for assessment of water quality.